On March 10, the second event in the frames of the program Political BOX initiated by the RPA Youth Organization took place. This time the guests of the "Political Box" were MP Samvel Farmanyan and Turkologist Levon Hovsepyan. Samvel Farmanyan noted in his welcoming speech that he welcomes this initiative because active young people are the bearer of modern trends, values ​​and aspirations, and should always create communication options. According to the MP, it is necessary to know about the expectations and value system of youth. 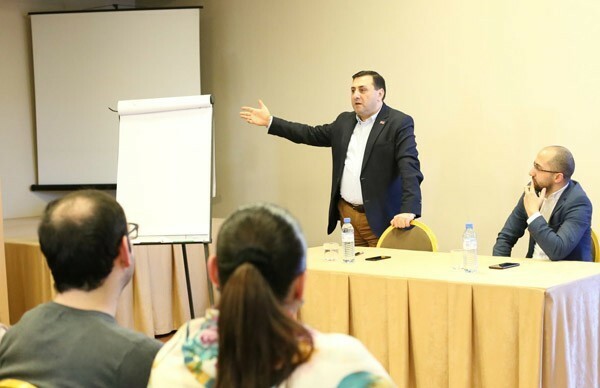 After the welcoming speech, the MP organized a discussion on the topic "PACE as a platform for Armenian-Azerbaijani diplomatic confrontation" with the representatives of youth and answered various questions. The next guest-expert was Turkologist Levon Hovsepyan: "This program is inspiring for me because it is a format where you are dealing with the most important part of society, with our youth, where discussions are mutually beneficial,"- mentioned the Turkologist. Through the "case" prepared by the expert, participants had the opportunity to participate in a simulation game-competition on international policy titled "Suspension of Armenian-Turkish Protocols." The results will be summed up later, and the winning team and the best participant of the day will receive awards.